INCLUDED with the veil is a lovely Flower feather fascinator hair clip that is sprinkled with rhinestones. The flower measures approximately 4 inches in diameter. 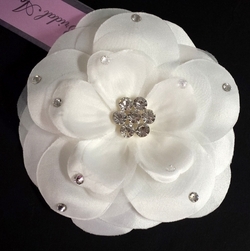 The back of each fascinator has a pin and a slide in hair clip for secure placement and comfortable wearing.